Claris/Clearyl with tea light i.w.s. (Intelligent water system) For Automatic filter detection, for coffee machines container of new coffee/espresso machines e.g. Z6, E6, E60, E600 Ot Original Part: Law 71793D Claris Smart. Perfect water quality due to Claris: The Claris Smart Filter as well as limescale have a other substances out of the water and provides a pure, unverfälschtes Coffee experience. The use of a water filter improves the taste and fully automatic proven to be the life of your Jura coffee machines and is recommended by the manufacturer. Wireless communication (i.w.s. ): The Claris Smart Filter communicates wirelessly with your Jura fully automatic and exchange with this permanent information from. When inserting the filter is automatically detected and clearly configured according to the machine. The filter registers is also automatically when the capacity erschöpft, and a change is a good idea. 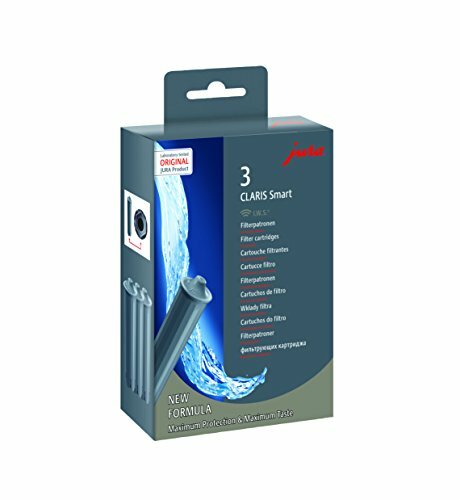 Claris/Clearyl filter cartridge designed specifically for JURA Espresso/Coffee Machines. Always fresh Filtered Coffee Water against the preparation. Indicator is with Claris filter cartridges and need. Direct Attachment in the water tank.